Although Black River Canal boats varied in size, they were typically 50 to 70 feet long, and stood 10 feet high. Boat size was limited by the size of the locks: 90 x 15 feet. These boats, which floated in in four feet of water, might carry loads up to 70 tons (2,500-3,000 bushels of wheat). The boats were constructed in open-air boat yards. Oak was used for the bow, pine for the sides, and hemlock for the inside timbers. Black River Canal boats resembled the Erie Canal Lakers depicted below, except that their bows were usually straight, not rounded. Horses and mules were stabled below deck in a cabin, approximately 9 x 12 feet, located the forecastle. The animals faced forward and were able to peer out small windows. The floor was tarred to protect the cargo below from urine. Boats usually carried two teams of draft animals, so that one team could work while the other rested. The teams were rotated in six-hour shifts. 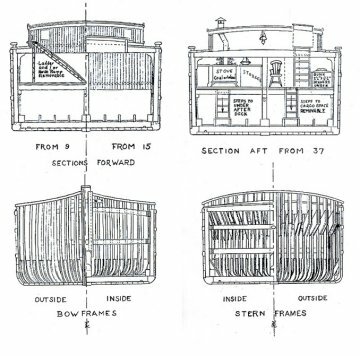 The boatman and his family had small living quarters located in the aft of the boat. This small area was typically lit by a kerosene lantern and equipped with a cook stove, kitchen table, stools, and rocking chair. Sleeping quarters were typically located in the stern, behind and partly below the general living quarters. 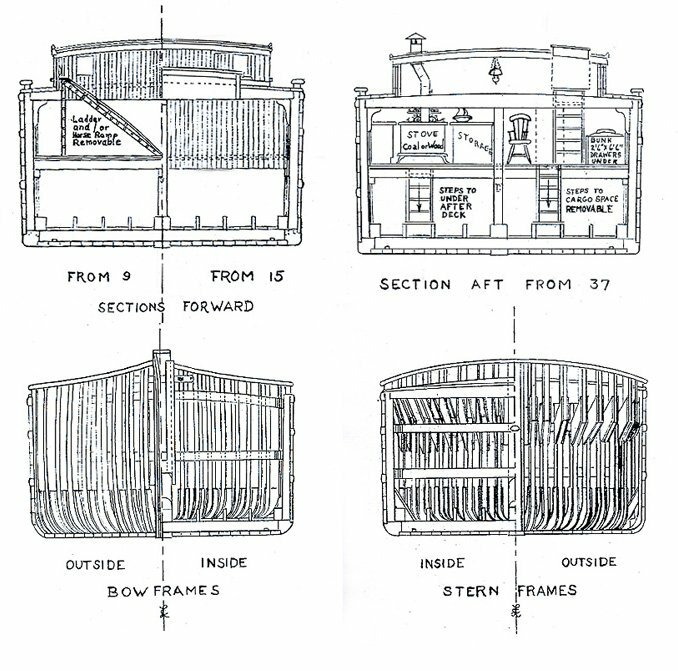 As the diagrams indicate, the fore and aft of the boat were two-tiered. with ramps, ladders, and steps for coming and going. For a detailed personal account of life aboard a canal boat, see Richard Garrity's Canal Boatman: My Life on Upstate Waters, published by Syracuse University Press, 1977.